The first time I talked to Brian Smith, aka God’s Outlaw, I interrupted a pleasant afternoon he was having grilling out on his porch, having a couple beers with his friends and family. The next time I talked to him, after we’d exchanged a round of e-mails, you’ll never guess what he was up to - back at the grill with some steak and more beer. As far as grassroots country-living and playing goes, God’s Outlaw is as real as it gets. The Outlaw’s last musical adventure ended with the implosion of the Wisconsin metal band, Double Life. Smith had recorded two albums with them, one of which was helmed by a Mr. Steve Albini. Nonetheless, the experience put him in a sour musical coma of sorts for about a year until he sauntered upon a revelation. His neighbors were right. He played around when opportunities showed up and then people started calling. The friends he was making would suggest other opportunities and now he reached where he is with some thirty Johnny Cash songs in his set plus a smattering of Hank Williams, Waylon Jennings and the like. “I started playing just for the appreciation of the music. I never intended it to get out of hand but, well, my buddy Eric Bulgrin (aka E-man) started getting me back into trouble and playing Luther Perkins-style pickin’ which really added energy and fun. I continue to perform solo shows but I would rather not play without him. Many of the Cash fans out there tell us they’ve never heard anyone play some of the songs we play,” he says. With his near dead-on Cash-style baritone, just listening to the clips at www.godsoutlaw.net can give a person chills. With ample energy coming through any speakers it’s played on, the live show can only be experienced. Smith says, “A typical God’s Outlaw show has a whole lot of yelling, dancing, spilling beer and laughing. 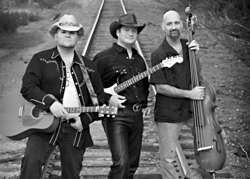 Many people sing along and it’s always a big happy party.” God’s Outlaw will be playing on our very own stage at the Atwood Summerfest, June 26 at high noon. Though tentative to start playing out with originals, he does have one that allegedly documents the careful process of rattlesnake hunting. Maybe somewhere down the line we’ll hear it, but for as long as he wants to go with this, neighbors and strangers can expect real deal outlaw country music from a real deal, steaks, beers and country guy.